The Central Garden at L.A.’s Getty Center is constantly evolving, with fresh plantings that provide an ever-changing palette of color. Created by Robert Irwin in 1992 through ’97, it’s a lovely place to let children run free—the hillside lawn is a popular rolling spot! “Always changing, never twice the same,” is carved into a plaza surrounded by bougainvillea arbors to emphasize Irwin’s approach to the landscape design. The Central Garden is just one part of the extensive grounds, which include a cactus area and viewing points to the Santa Monica mountains and Pacific beyond. 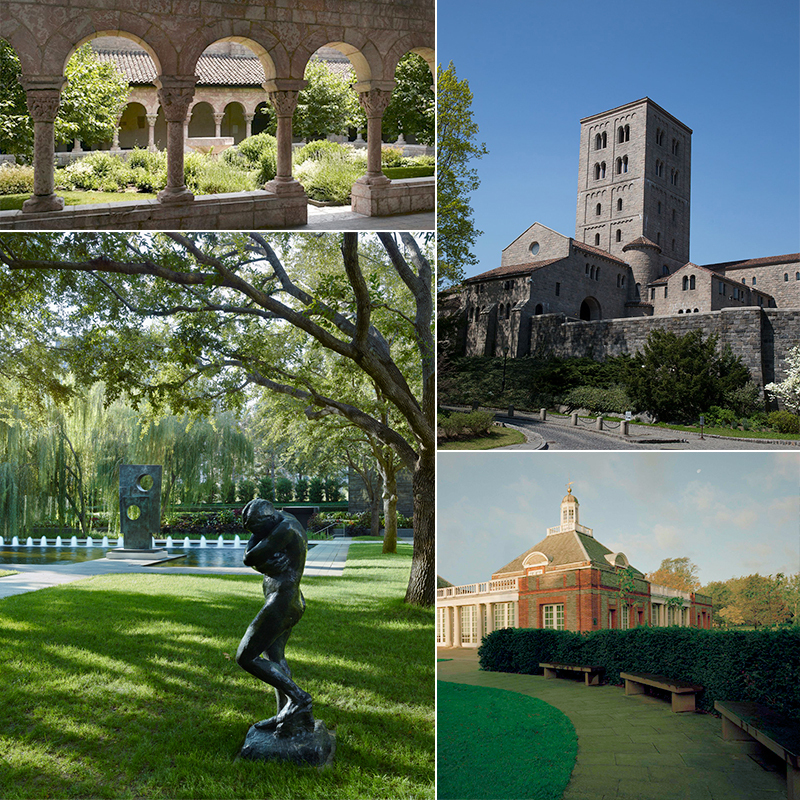 Part of New York’s Metropolitan Museum of Art, the Cloisters Museum & Gardens is located on four-acres in northern Manhattan’s Fort Tryon Park, overlooking the Hudson. The gardens provide a sedate setting as well as historical meaning, with medieval plantings based on documents, poetry, and art from that period. The building, which houses around 2,000 works of art from medieval Europe, appears much older than it actually is. It was built in the style of medieval cloisters and opened to the public in 1938. A 12-century apse from a church in Fuentidueña, Spain, was added in 1958. The Nasher Sculpture Center is an oasis of green in the heart of the Dallas Arts District, dotted with modern sculpture by the likes of Alberto Giacometti, Barbara Hepworth, and Richard Serra. Designed by landscape architect Peter Walker, the two-acre garden works as a “roofless” continuation of the low-level museum designed by Renzo Piano—consisting of five parallel pavilions made from Italian travertine and glass. It’s a lovely escape from the streets of downtown Dallas, with ponds, small meadows, and a large cedar-elm grove. A Royal Park, rather than a garden, is the location of London’s Serpentine Galleries. Its sprawling 265 acres includes stately avenues of trees, ornamental flowerbeds, and the beautiful Italian Gardens. The Serpentine Gallery, established in 1970 in a former classical-style tea room, and the Serpentine Sackler Gallery, designed by Zaha Hadid Architects in 2013 in a former 1805 gunpowder store, show contemporary art and architecture. The lawn outside the original gallery is also the site of the yearly summer Serpentine Gallery Pavilion, created by a noted architect. This year’s pavilion by Danish architect Bjarke Ingels and his firm, Big, based in Copenhagen and New York, opens June 10.